The seventh-seeded San Antonio Spurs begin the 2019 NBA playoff on the road in Denver against the second-seeded Nuggets. Oddsmakers have made the Nuggets the favorites but give the Spurs a better chance than most teams that enter the postseason seeded seventh. While the Spurs had a roller coaster season featuring impressive highs and depressing lows, the Nuggets were perched atop the Western Conference standings for much of the season before they clinched the second seed on the final day of the regular season. Overall, the 54-28 Nuggets finished six games ahead of the 48-34 Spurs. What can we expect in this series? Let’s dig in. While the Nuggets have been firmly in the top half of the West for literally the entire season, they’ve slowly but surely become increasingly mediocre as the season progressed. After winning nine of their first ten games and 37 of their first 52, Denver won only 17 of their final 30 outings. In their last 22 games, they’re 12-10. If you look at the season as a whole, the Nuggets have outscored opponents by 4.0 points per 100 possessions — the eighth best mark in the league and much better than San Antonio’s mark of 1.4 points. But if you zoom in and look at games after the All-Star break, Denver has outscored opponents by 1.9 points per 100 possessions, which is 11th in the NBA and trails the Spurs (3.4 points) over the same time frame. Over the last 22 games in which the Nuggets went 12-10, they’ve outscored opponents by 0.1 points per 100 possessions. During that time, the Spurs have outscored opponents by 5.3 points per 100 possessions. Sure, there’s definitely some cherry-picking going on with those statistics, but it’s safe to say the numbers suggest the Spurs have been the better team since the beginning of March. This is a battle of two bad road teams. In fact, the Nuggets (20-21) and the Spurs (16-25) are the only two Western Conference teams that made the playoffs with a losing record on the road. It’s also a battle of two very strong home teams. San Antonio was 32-9 at home, which was tied with the Portland Trail Blazers for the second best home record in the West (and tied along with the Toronto Raptors for third best in the NBA). The team with the best home record in the league? Yes, the 34-7 Nuggets. However, it should be remembered that Denver has a built-in, verifiable advantage: elevation. Playing a mile above sea level gives the Nuggets an edge — backed up by research. While Denver’s home record was likely artificially boosted, it’s obviously impossible to know how many extra wins they got this season due to that advantage. One? Four? All things equal, the Nuggets are likely at least a little bit worse than a typical 54-28 team. And for San Antonio’s sake, let’s hope that they can get acclimated to the elevation at some point this series. The fact that the Spurs, due to the scheduling, have multiple days off prior to each of the first three games in Denver could be very beneficial in terms of neutralizing that advantage. One area where the Nuggets thrive is on the offensive boards. They led the league by grabbing 30.8% of available offensive rebounds. Denver also led the league in second-chance points at 15.5 points per game; their per 100 possessions rate was far and away the best mark in the league in that category. The Spurs, however, are equipped to deal with this potential problem. They grabbed 74.4% of available defensive rebounds, which was tied for fifth in the league. They were also one of the better teams in the NBA at limiting second-chance points. Things look even rosier for San Antonio when you factor in that Jakob Poeltl is very likely to start next to LaMarcus Aldridge. When those two were on the court together this season, the Spurs pulled down 76.4% of defensive rebounds — a mark that would have led the league. With much of the NBA going small, the Nuggets have made a living out of utilizing big lineups featuring two of Nikola Jokic, Paul Millsap and Mason Plumlee. That type of size and strength overwhelms a lot of teams these days. But the Spurs, using the Poeltl and Aldridge combination, can counter from the opening tip and hopefully minimize what is typically one of Denver’s areas of dominance. The Nuggets had such a successful regular season largely due to their unselfishness, talent and depth. They have nine players who averaged at least 20 minutes per game during the regular season and a tenth who averaged 19.4 minutes. They also didn’t have a player who averaged more than 33 minutes; Jamal Murray led the way for the Nuggets at 32.6 minutes per game. Ironically, this Denver team is built a lot like the 2010 to 2015 Spurs in that way. Those Spurs were obviously talented but they had to utilize depth to make up for the fact that their big guns were no longer capable of logging big minutes. In the playoffs, though, depth is simply not as important or helpful as it is during the regular season. Depth isn’t bad, mind you, but in the postseason it’s better to have star players who can play 42-plus minutes when it’s needed. For example, San Antonio experienced exactly that in multiple series against the Oklahoma City Thunder when OKC could simply play their three future MVPs nearly the entire game, which would more than nullify the Spurs depth advantage. Looking at this series in particular, the Spurs have a couple players in Aldridge and DeMar DeRozan who can play extended minutes if needed. The Nuggets, on the other hand, have a superstar in Jokic whose main weakness is he gets fatigued relatively easily. In fact, the center from Serbia didn’t play more than 40 minutes in any game this season. Perhaps Murray, Denver’s second best player, can flip the switch and play big minutes but he doesn’t have much experience doing that either. If the Nuggets lose this series, one of the reasons will be because their depth advantage on paper didn’t translate to the postseason. How much does experience help in the playoffs? It’s difficult to quantify but I think it’s safe to conclude that experience helps to some degree. Denver’s one source of playoff experience is 34-year-old Paul Millsap. San Antonio has a few green players as well but they also have a handful of players with vast playoff experience. Oh, and a coach who knows a thing or two about the postseason. I’d be remiss if I didn’t acknowledge the fact that these two teams played each other ten days ago and the Nuggets destroyed the Spurs by a final score of 113-85. Denver, playing in front of their home fans, never trailed and basically ended the game in the third quarter. Watching that game, the Nuggets looked a lot more talented than the Spurs. They were simply better at every facet of the sport and made the good guys look old and slow in comparison. However, while the Nuggets looked much better than the Spurs on that day, remember that San Antonio was playing on the second night of a back-to-back and that Pop got ejected a couple seconds into the affair. Give Denver credit, certainly, but it wasn’t exactly the fairest of fights. What’s not debatable is the fact that the Nuggets have been much, much better in clutch situations this season. In close games, they had the NBA’s best winning percentage at 67.4%. During clutch situations, the Nuggets outscored opponents by 12.9 points per 100 possessions. Compare that to San Antonio, who outscored opponents during clutch situations by a mere 1.2 points per 100 possessions, and that doesn’t paint a pretty picture for the forthcoming fourth quarters in this series. Not only have the Nuggets been money down the stretch of games, they had a number of remarkable comebacks this season. In one game, they erased a 25-point second half deficit to stun the Memphis Grizzlies. In the final game of the season, they beat the Sacramento Kings despite trailing by 11 points with four minutes remaining in the fourth by scoring the contest’s final 15 points. And then there was that game in San Antonio back in early March when the Nuggets climbed out of a 21-point hole and almost won it. If you remember correctly, they were down ten points with 2:31 remaining, scored nine straight points and then had three shots that could have won it in the game’s final 16 seconds. The moral of the story is no lead is safe against this bunch. They’ve proven that this season. A fascinating battle will take place behind the three-point line on San Antonio’s side of the court. While the Spurs led the league in three-point percentage at 39.2%, the Nuggets had the league’s best three-point percentage defense at 33.9%. The Spurs don’t rely heavily on three-pointers (they were last in the league in three-pointers attempted) but they do rely heavily on the spacing created by the threat of their three-point shooting marksmen. If the Nuggets can shutdown the Spurs three-point shooters without bending their defense too much, things could clog up in a hurry for San Antonio. This Spurs team is not athletic, to put it kindly. In fact, it’s safe to say that they are one of the most unathletic teams in the NBA. They have one high-quality perimeter defender in Derrick White and only a couple players capable of staying in front of even average slashers. The Nuggets, conversely, are stuffed to the gills with athletes. I pointed out the possible downsides to their youth earlier but with that youth comes a level of athleticism the Spurs will really struggle to match. Hypothetically, even if White is able to take away one of Denver’s weapons, the Nuggets will always have at least a couple more weaknesses on the perimeter to exploit. That’s a scary proposition for San Antonio. The hope for the Spurs is that things will slow down in the playoffs and they can rely on team-defense in halfcourt settings (along with clever coaching tactics) to mitigate their lack of athleticism. That hope is bolstered by the fact that the two teams played at almost the exact same pace during the regular season, so this series is unlikely to be a case where Denver will simply be able to run San Antonio out of the building using their superior athletes. The old NBA saying is that the team with the best player usually wins the playoff series. In this case, the best player in the series is Nikola Jokic. He was an MVP candidate all season long and he earned every bit of the praise. For the season, Jokic averaged 20.1 points, 10.8 rebounds and 7.3 assists, while shooting 51.1% from the field and 82.1% from the line. On top of that, he’s a legit three-point threat, his big body can be disruptive on defense and his feel for the game is as good or better than any bigman in the history of the league. A lot has been made about DeMar DeRozan’s playoff struggles in his career. And, yes, he’ll have to rightfully carry that reputation until he can prove otherwise. But I think DeRozan’s struggles in the postseason have been a little bit overstated. While he’s been bad in series that featured LeBron James on the other team, DeRozan has had pretty good series against other teams. Last season, for example, he averaged 26.7 points per against the Washington Wizards with decent to good efficiency numbers. In 2017, he put up similar stats against the Milwaukee Bucks. Don’t write him off completely just yet. That said, let’s hope DeRozan avoids reverting to hero-mode down the stretch of playoff games. The Spurs are best in fourth quarters when White, DeRozan and Aldridge share the playmaking. After last season, Gary Harris looked like a potential star in the making. He averaged 17.5 points, shot the ball great and played strong defense. This year, though, injuries sidetracked his campaign. Instead of becoming a star, Harris turned into Bryn Forbes. Seriously, if you look at their numbers, they were almost the same player this season — except Forbes shot a lot better. If Harris can regain his star-in-the-making ways, that’d give the Nuggets a huge lift. 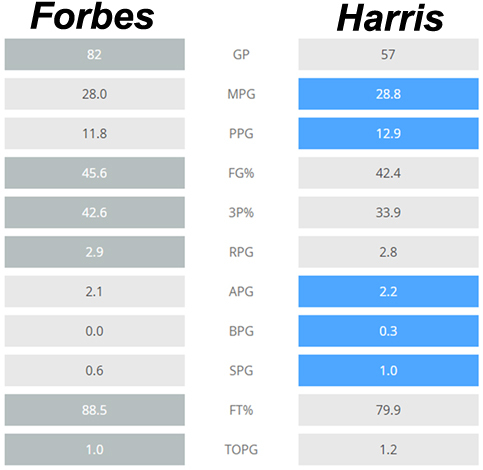 Similarly, if Forbes can outplay Harris, that’d be a momentous win for the Spurs. The way this team is constructed, San Antonio must have Derrick White play well to be successful. There’s no two ways about it: If White plays well, the Spurs are a quality team. If White struggles, all cohesion is lost and sustained success is impossible. Why is he so important? As I stated previously, he’s the team’s best perimeter defender — by a mile. He’s also the team’s best pick-and-roll orchestrator, best passer and has the best court vision. Down the stretch of games, you can already make the case that he’s the most composed and the most trustworthy to make the correct play. At times in the last month or so, White has looked tired. Dead tired. It looked like he may have smashed into the dreaded rookie wall. Going against his hometown Nuggets, let’s hope White can summon the needed energy. Remember, his season took off after he played an excellent ballgame in Denver back in late December. Doubling Jokic: Suicide Or Good Idea? How the Spurs opt to defend Jokic will be a key strategy decision to pay attention to as this series unfolds. If the regular season is any indication, the Spurs will double-team Jokic early and often. On paper, that looks like a risky idea because Jokic is such a good passer that he can eat double-teams for lunch and spit out a wide open three-pointer for a teammate. But in reality, the Spurs coaches apparently believe that if you take away his scoring, the Nuggets will struggle to find dependable alternatives. Look for the Spurs to send double-teams Jokic’s way in Game 1, at least at the beginning. If he shreds the defense with his passing, they’ll adjust. Then again, perhaps Pop knows the Nuggets will prepare for the double-teams and will instead throw a curve ball by single-teaming Jokic. We’ll see. The 2018-19 Spurs have been an interesting bunch. They’ve been terrible at times (see their 11-14 start to the season or the forgettable Rodeo Road Trip) but they’ve also been elite at times. Don’t forget that from mid December to mid January, they were amazingly both the best offensive team in the NBA and the best defensive team in the NBA. They also had that impressive nine-game winning stream coming out of the Rodeo Road Trip. The real Spurs are somewhere between the two extremes. I think they are closer to the positive side than the negative side … but the playoffs will be the test, right? The Nuggets are a formidable opponent. Jokic is a superstar. Their supporting cast is deep, talented and athletic. I believe there will be times when the Spurs struggle to deal with Denver’s physical advantages. But I think, overall, this is a good matchup for San Antonio. They have the big lineup to negate some of the Nuggets strengths. They have a notable experience advantage. Aldridge is playing really well right now and I think that will continue. I believe White will be re-energized and DeRozan stay within the offense. The Nuggets have a bright future but my prediction is the seventh-seeded Spurs advance in six games.